APPSC Notification is out. APPSC is recruiting for 667 TGT PGT Posts Posts. You can check APPSC - Arunachal Pradesh Public Service Commission last date, download APPSC notification, visit APPSC official website and check other APPSC Vacancy details.Complete Vacancy and recruitment Details about 667 TGT PGT Posts vacancies in APPSC are provided below by JobSarkari.Com only for you. Last Date of Apply Online. 19/07/2018. English. 03. 10. 01. 01. 15. Hindi. 03. 10. 01. 01. 15. History. 03. 11. 01. 01. 16. Political Science. 03. 11. 01. 01. 16. Geography. 03. 10. 01. 01. 15. Economics. 03. 10. 01. 01. 15.
Business Administration. 01. 04. 00. 00. 05. Accountancy. 01. 04. 00. 00. 05. Agriculture. 00. 02. 00. 00. 02. Mathematics. 03. 03. 00. 00. 06. Physics. 03. 03. 00. 00. 06. Chemistry 03. 03. 00. 00. 06. Biology. 02. 03. 00. 00. 05. Total Vacancy. 31. 84. 06. 06. 127. English. 13. 51. 03. 03. 70. Hindi. 13. 51. 03. 03. 70. Political Science. 07. 28. 02. 02. 39. Geography. 07. 28. 02. 02. 39. Economics. 07. 28. 02. 02. 39. History. 07. 27. 02. 02. 38. Agriculture. 02. 10. 01. 01. 14. Horticulture. 01. 06. 00. 00. 07. Mathematics. 26. 26. 02. 03. 57. Physics. 25. 26. 02. 03. 56. Chemistry 25. 26. 02. 03. 56. Biology. 25. 25. 02. 03. 55. Total Vacancy. 158. 332. 23. 27. 540. Grand Total. 189. 416. 29. 33. 667. Post Graduate Teacher (PGT). Candidate Must Have Passed Master Degree With 2nd Division in Related Subject And Having B.Ed Degree. Trained Graduate Teacher (TGT). Candidate Must Have Passed Bachelor Degree with 2nd Division in Arts/ Science/ Commerce And Having B.Ed Degree. PGT. 18 Years. 35 Years. TGT. 18 Years. 33 Years. Age Relaxation. 5 Years For APST And 10 Years PWD. 4. Candidate Need to Upload All the Mandatory Documents Like Cast Certificate, Mark Sheet, Address Proof and Passport Size Photos As Prescribed Size And Format. Q. What is the Last Date For APPSC TGT PGT Posts Vacancy ? A. 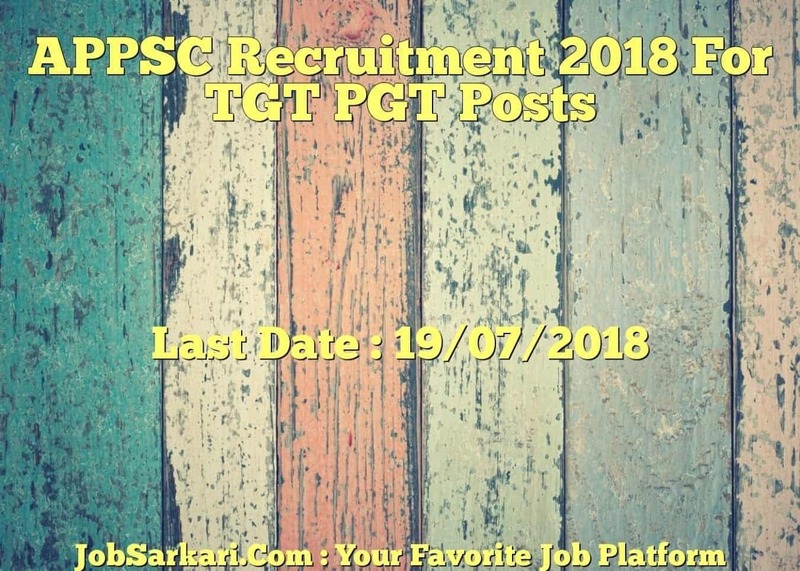 Last Date for APPSC TGT PGT Posts Posts is 19/07/2018. Q. 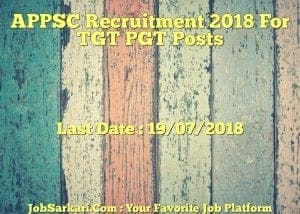 What is the Form Type of APPSC TGT PGT Posts Recruitment ? A. The Form Type for APPSC TGT PGT Posts Posts is Online. Q. How many vacancies are available in Arunachal Pradesh Public Service Commission TGT PGT Posts Posts ? A. There are about 700 Vacancies in Arunachal Pradesh Public Service Commission TGT PGT Posts Posts. A. Full Form of APPSC is Arunachal Pradesh Public Service Commission .